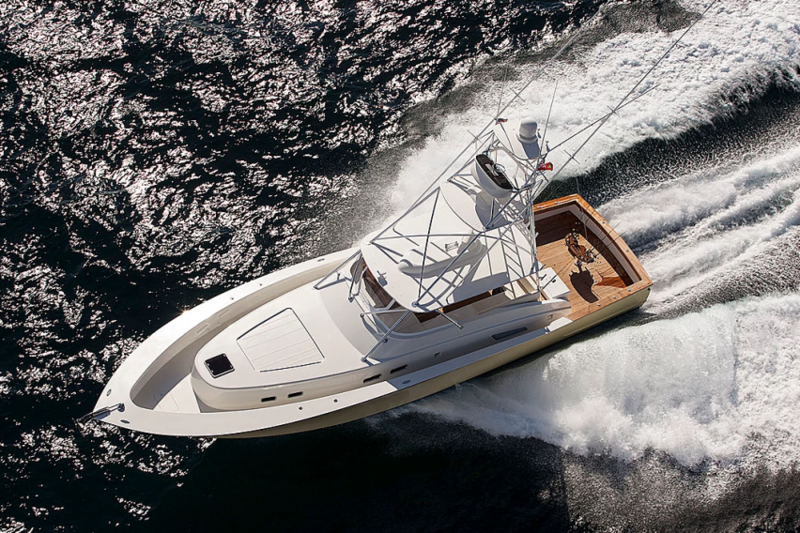 Sapelo - Mac Gregor Yachts Inc.
“Sapelo” is one of the finest sportfishing boats ever built. She is extremely fast and efficient, and her fit and finish are unparalleled. A tremendous sportfisher with yacht quality throughout. Her luxurious amenities and fish ability maker her the best of both worlds. Walking into the salon, to port houses a huge living area which features a custom L-shaped leather sofa, oversized leather chair and coffee table for lounging. Beautiful hand rubbed satin finished teak surrounds the interior of this exquisite masterpiece. To starboard, across from the sofa area, you will find built-in teak cabinetry which features a pop-up 55” Samsung television, full entertainment center and tremendous drawer storage. Moving forward and up one step to the gourmet galley area, is where this boat shines and is unique from any other sportfish out there. To starboard there is a full bar housing (2) SubZero 30” refrigerated drawers, an ice machine, bottle storage and a large custom wine cooler. Over to the center of the galley, facing the salon, is the cooktop and full oven built-in to teak cabinetry and accented by custom cream-colored marble, along with a full stand-up refrigerator. All the way to port offers the oversized stainless-steel sink, under-counter garbage receptacle, storage, and two drawer style dishwashers. Directly in the middle of the galley you will find the full island with tremendous storage and convection microwave. Forward to port is the huge custom dinette that seats eight. Heading forward into the enormous pantry, providing great storage for dry goods, a full size stand-up freezer, (2) SubZero freezer drawers and a full-size washer and dryer. Moving forward down into the companionway, curving to the left and down 3-steps, is the oversized full beam master stateroom. This incredible teak accented stateroom features a full width king bed with tremendous walk-around abilities. Complimenting this stateroom is a beautiful built-in console area with six large drawers, vanity and a 55” Samsung television. There is plenty of storage with eighteen storage drawers and five very large closets. Featuring his and her full beam heads divided by an oversized custom shower. Heading forward to port is the VIP stateroom with a full walk-around queen berth with fantastic storage, exquisite décor and its own full head and shower. Across to starboard is another large guest stateroom featuring oversized side-by-side beds along with a Pullman berth for extra sleeping capabilities. This stateroom has very generous drawer and closet storage along with its own full head and shower. Moving into the bow section you will find two a-like staterooms featuring over/under berths with great storage and are separated by a large and roomy ‘Jack and Jill’ style head and shower. The cockpit of the “Sapelo” is mammoth in size and very well laid out for tournament fishing. Everything has its own convenient place for a very clean look. The air-conditioned mezzanine adds comfort and great amenities. This massive bridge area is both functional and luxurious. The helm is finished with beautiful bright varnished teak and state of the art Garmin electronics. There is seating for twelve guests in this air-conditioned area along with a custom 2-person Shaze lounger. 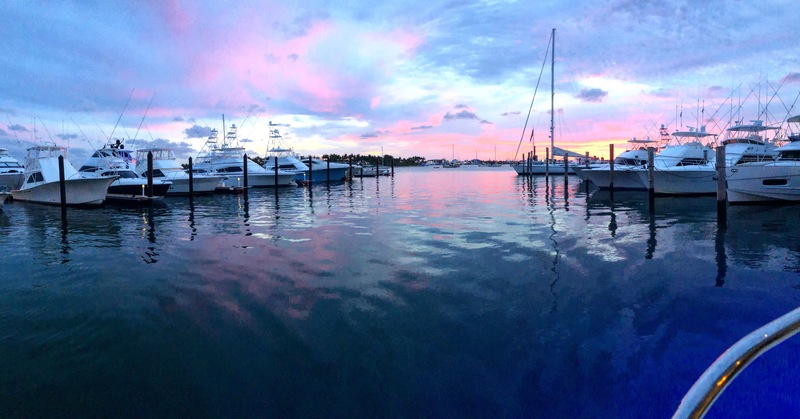 This area is perfect for both intense fishing or relaxed cruising. The fit and finish of this spectacular engine room is breathtaking. The 2600hp MTUs are enormous in size and there is still incredible space to move around to get to everything. Engineering was the main focus allowing for the perfect center of gravity and ease of maintenance. “Sapelo” is the most impressive large sportfisherman out to the open market. She represents class and beauty along with unmatchable speed and efficiency. No other 86’ vessel can achieve her speeds. Holding 3500 gallons of fuel and cruising at 1650 rpm’s giving you a 30 knot cruise while burning 100gph, is simply unheard of and will take you anywhere you want to go. She is like new and a pleasure to show.